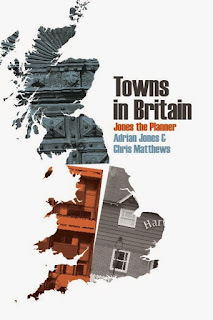 This is the first of a series exploring architecture and planning in some of Britain’s towns and cities. 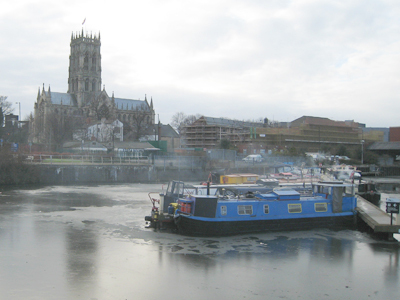 What do people know about Doncaster? Well, it’s on the way to The North. 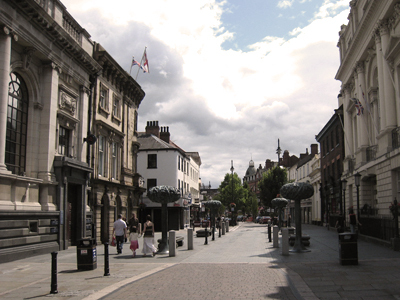 Not as famous as Hatfield perhaps but Doncaster actually is in The North – only just geographically but 100% in a cultural sense. Heading up the A1 the ruling elite is probably already out of its comfort zone before reaching Grantham, Mrs Thatcher’s home town. Fifty miles further on Doncaster with its railway works and heavy engineering surrounded by collieries represented all the things she hated and she closed them down, leaving this Championship League town of more than 100,000 people (nearly 300,000 in its Metropolitan District) with the big problem of how to re-invent itself. Your approach from the motorway clearly illustrates the new economy – huge distribution sheds, retail parks, call centre barracks and cheap small offices where the main event is the car park, all strung out along White Rose Way. This expressway is littered with roundabouts which are actually the most interesting thing as in the season they sport eccentric topiary displays celebrating Doncaster’s achievements, like race horses and steam engines which are a lot of fun. The expressway sweeps on through 1960s redevelopment and past Doncaster Station and St George’s Minster, severing both from the town centre (of which more later). Amazingly you can drive right through the town centre at 40 mph. 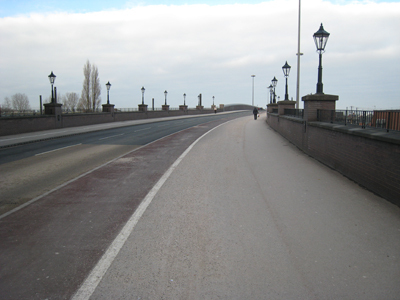 In Donny the Highway Engineer rules OK. However if you approach from the south along the old Great North Road (now the A638) the impression of Doncaster is not of the post industrial north but a handsome county town, which of course is what it was before the heavy industry arrived. You pass Doncaster Racecourse, one of the country’s premier courses since the C18th and home of the St Leger. The racecourse is important to the identity of Doncaster and is big business – attractive old stock brick stands remain but are overwhelmed by large scale modern structures. Hotels for race goers along the Great North Road include a startling 1930s edifice - white with crenellations. 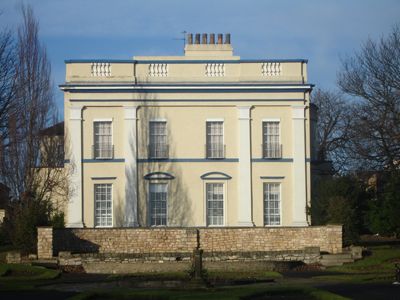 On South Parade there are many attractive late Georgian houses, some with giant pilasters and pediments and others simply with decorated porches or doors. The C18th elegance of South Parade becomes the more mixed Hall Gate, with worrying vacancy and derelict sites. 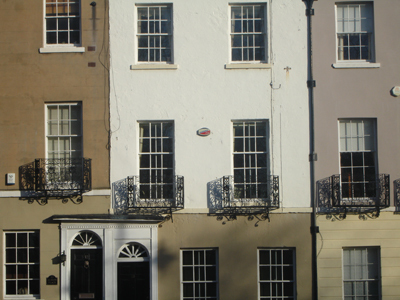 You continue into High Street which contains many fine buildings including the grand Mansion House (1745) with Corinthian columns and a beautiful Venetian window. The Great North Road really is quite something and from this direction Doncaster looks very promising. Doncaster grew enormously when the Great Northern Railway sited its works here in the 1850s. Between the wars they built the Flying Scotsman and Mallard here. The works are now gone but Doncaster is still an important junction on the East Coast main line with excellent connections – only an hour and a half away from King’s Cross. 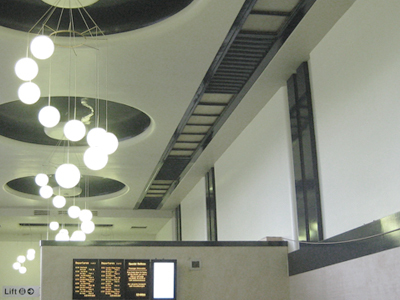 The Station was built as a job creation scheme in the 1930s depression and has a rather utilitarian exterior although the concourse is coolly elegant moderne. Leaving the station you are immediately confronted by the speeding traffic and idiot rails of Trafford Way but even worse is your view, which is of the blank backside of an old Sainsbury’s supermarket. This must be a contender for the worst approach to any major town in the country. Amazingly Sainsbury’s is built over the former Station Street leaving only a pathetic rump of the derelict Grand Theatre. To your left is the Frenchgate shopping centre extension, a monstrosity which straddles the expressway. In order to reach the town you are forced through the shopping centre and then via a maze of identikit malls until you eventually find the sanity of the street. Doncaster still retains much of its medieval street pattern. Hall Gate, High Street and French Gate leading to the North Bridge over the Don were all part of the grand Great North Road. St Sepulchre Gate goes west towards the Station and Baxter Gate east to the Market Place. These mostly pedestrian streets form a very attractive core for the town. High Street is very nicely paved with interesting art work and street furniture. Along Baxter Gate you will find the irregular Market Place containing the fine Market Hall of 1875 with a massive glazed arched roof like a railway shed behind grand facades. The Fish Market is a stripped down slightly Deco addition, and the more utilitarian Wool Market (actually household goods) encloses to the east. The market is wonderful with a huge range of fresh produce including things like pheasant and turbot which suggest a rather more affluent clientele than is immediately apparent. On market days the stalls spill out into the market place. Scot Lane, with its confident commercial architecture or Silver Street, vertical drinking central on Friday and Saturday nights, will lead you back to High St.
Cleveland Street continues the sleazy theme of Silver Street, but contains some interesting buildings. 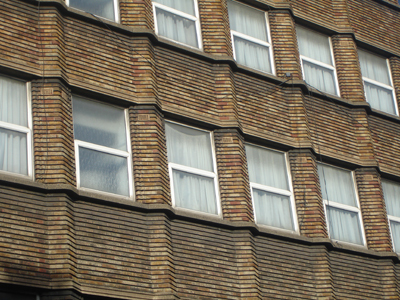 These include a striking tall 1930s block with thin angled brown brick columns. Further west is the Waterdale shopping precinct in the style of a New Town centre but lacking conviction. 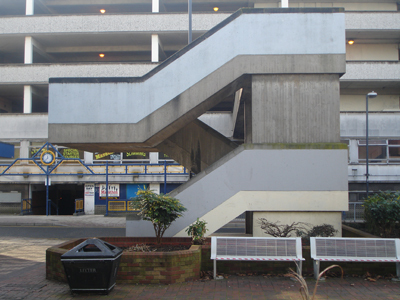 The best bit is the Southern bus station and multi storey car park. This has interestingly angled geometry giving it a strong sculptural quality, its fretwork screens looking almost exotic. 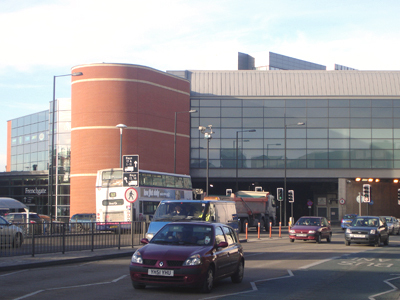 The bus station which generated footfall has been moved to the new Interchange (see later), so it is hardly surprising that the precinct is in terminal decline. 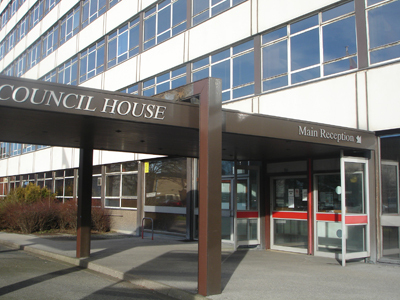 The area south of Waterdale was intended as a new civic centre but there was never a coherent plan and the buildings mostly lack any civic quality. 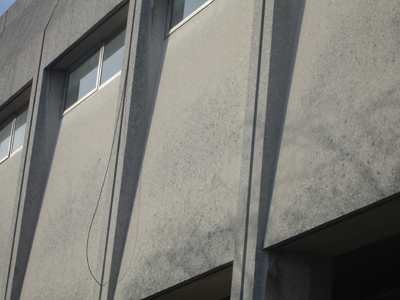 The Council HQ is a tall 1960s slab block which does have some presence in a mostly low rise town but there is no setting for it such as a public square - it looks out listlessly over the expressway with no relationship to other buildings. The dreary library looks like a funeral directors and the Civic Theatre is just a ramshackle mess, rather underlining the failure of civic ambition. 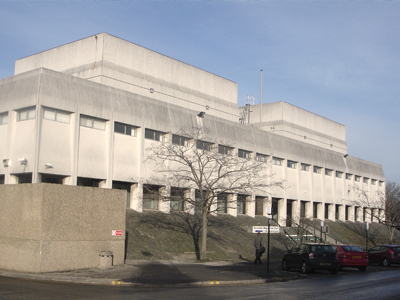 The most impressive structures are the Magistrate’s Courts and Police Station by Frederick Gibberd; fortress-like, grey and austere but with solemn integrity. 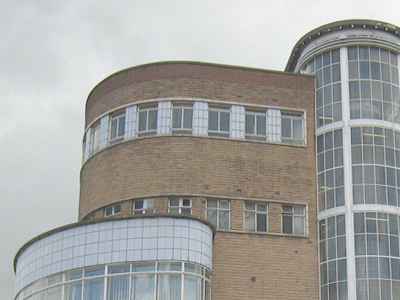 Hidden on Chequer Road is the jolly Museum and Art Gallery which looks as if it has escaped from the Festival of Britain. Nearby is the new Doncaster Foyer, an interesting and well proportioned building. 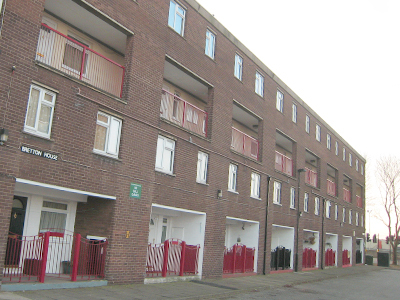 West of the civic centre and surrounded by a triangle of expressways is the 1960s St James Street housing. This is interesting as the maisonette blocks are clearly inspired by Scandinavian example, although without the generous landscaped open space. The more typical high rise flats give some monumentality to this approach to Doncaster. It is a pity that the groundscape is confused and dominated by complicated roads and parking. 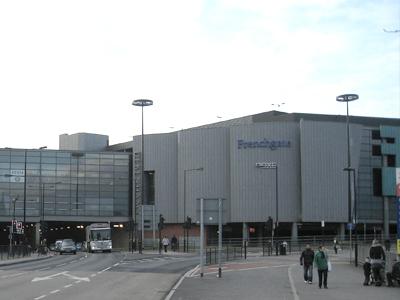 Back along inner relief road you return to the Station and its elephantine neighbour the Frenchgate extension. What is so awful about Frenchgate apart from its hulking mass and the absurd attempts to jazz it up is that it is sucking the vitality out of the real heart of the town. Why on earth in a place with the modest scale of Doncaster would you cram your new shops in a huge mega structure on the edge of centre and across the inner relief road? Well, in theory this is justified by the new Interchange – a subterranean bus station next to the Station. Planners think interchanges are a Good Thing, although in practice they are nearly always inconvenient and dismal. From the Station you are directed up escalators to the shopping centre and then down again to the buses, but if you are really cute you will notice that it is possible to reach your bus directly and on the level across the gloomy roadway. Because the shopping centre has no external reference points and completely standard anonymous mallscape it is hopelessly illegible. 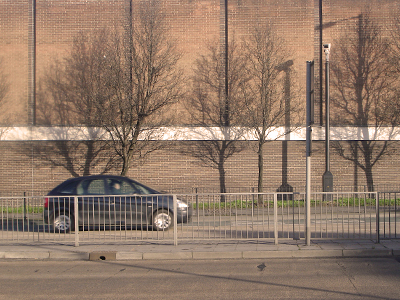 To complete the disorientation of this part of town there is no pavement along the road under the shopping centre so pedestrians have to pick their way along the kerbs past the gaping maw of the service yards. This is public squalor on steroids. 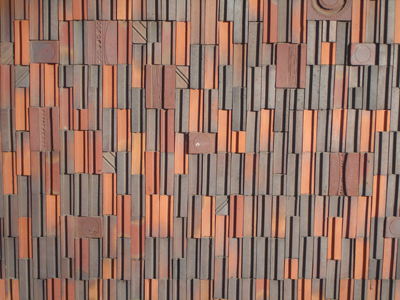 It is not worth describing the architecture because there isn’t any. After this trash the sight of St George’s Church provides a visual and spiritual cleansing. It is a real tour de force designed by George Gilbert Scott in 1844 after a fire had destroyed the medieval parish church. 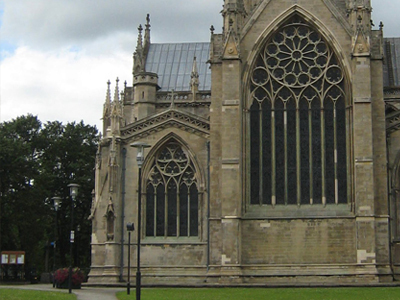 Pevsner calls it ‘proudest and most cathedral like of (Scott’s many) parish churches’. It is rightly termed a Minster and with its grand tower certainly looks like a miniaturised cathedral. Its scale and confidence give dignity to Doncaster and it provides an impressive skyline dominating the extensive views of the town centre along the Don Valley, despite the massive bulk of the Frenchgate Centre. The Minster, stranded by the dual carriageway (here insultingly called Church Way), opposite the M&S service yard and next to Tesco, disdains the surrounding dross. 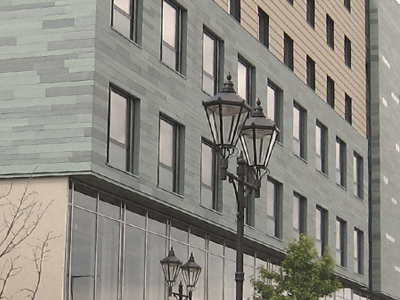 Belatedly its context is being improved with the renovation of the long range of fine Edwardian college buildings to the north, and a new Premier Inn on Church Way – a decent building which takes some care with its context and design, addressing the surrounding streets and providing interesting elevations. It currently also houses The Shed architecture centre which works with schools and the community. You get a good view of the Minster and the new hotel with its grainy green tiles from the massive new viaduct which spans the Don and the railway. Whether this justifies the extravagance of the new road (which duplicates North Bridge) is questionable, but it certainly illustrates the dominance of the Highway Engineer. (Again no pavements are provided so people walk on the kerbs.) Beyond the new road and next to the Don is shiny new Doncaster College. It’s big and, err, shiny like similar new colleges up and down the land. There is a bit of an esplanade to the waterfront with a small marina. The Don is a serious river with a New Cut canal as well as the old channel, so it is a formidable barrier to the north of the centre. This is reinforced by the old engineering works mostly now vacant or demolished. There are big plans for regeneration here, of which more later. The biggest regeneration area in Donny to date is Lakeside, between the Racecourse and White Rose Way. It does have a big lake and lots of landscaping but actually all the landscaping tends to reinforce the isolation of the buildings from each other and increase the illegibility of the plan. What you really remember is completely losing your sense of direction because of the endless roundabouts where all the roads look exactly the same – there is absolutely no hierarchy. At the Racecourse end there is a big leisure Dome, the usual multiplex and a tatty mega Asda with the biggest car park you have ever seen and the usual parasitic drive thru MacDonald’s etc. At the other end is the Lakeside Village Outlet shopping centre, with the second biggest car park you have ever seen. Despite the silly name this is quite refreshing in its honesty - no messing about, just a big car park and a double line of simple shop structures along an open ‘street’, so at least you know where you are going and can get some fresh air if you want to. There are even some quite useful shops. In between are lots of the standard regeneration style apartments, houses and small offices, with the Rovers’ unassuming new stadium at the back. It is not awful, just fairly typical of Brownfield regeneration in Britain today. Returning from Lakeside you can cheer yourself up by exploring the attractive residential area around the Town Field, a big open space laid out in the late C19th when the fields were developed and an early example of planning gain. 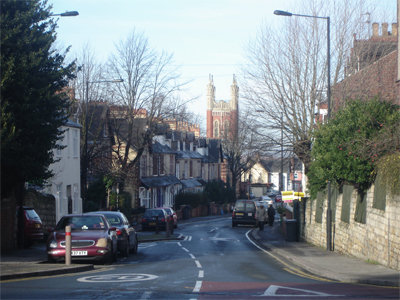 Thorne Road is lined with big C19th gothic villas. It starts as a triangle with the wonderfully picturesque Christ Church (1829) in the middle. 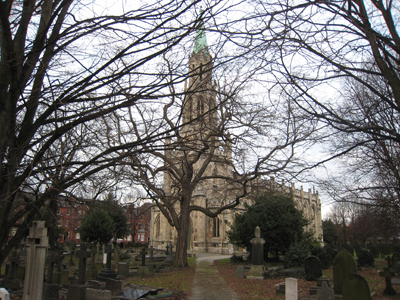 This has a fantastic octagonal spire, which plays with the St George’s tower to make a really dramatic skyline. No longer a church it desperately needs a new community use. 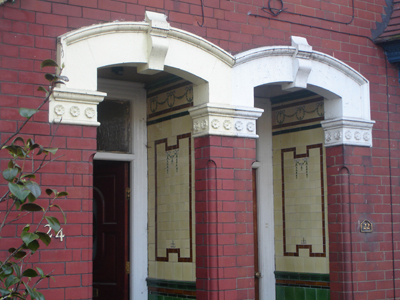 North towards Becket Road are numerous avenues of well designed and nicely detailed pre 1914 terraces and houses whilst to the south big villas face on to the park. Along Town Moor Avenue (which fronts Town Field linking to the Racecourse) and in the avenues beyond there are many grand rather overlarge Edwardian houses and big interwar semis, some almost Expressionist in their exaggeration. Although in parts run down, this is a really good inner city suburb. What of the future? Manufacturing towns like Doncaster have suffered particularly from the spite of Mrs Thatcher, the indifference of Blair, the incompetence of Brown and above all the stranglehold of London. The imperative to promote regeneration is very strong even when, as with Lakeside and Frenchgate, this can look fairly desperate. 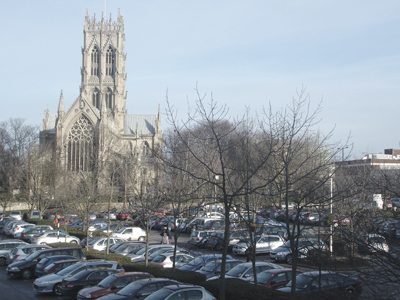 Doncaster is trying to raise its game and has adopted a ‘Renaissance Town Charter’ and a town centre Masterplan produced in 2003 by Urban Initiatives, leading practitioners of urban design. This contains a lot of good analysis, sensible design guidance and some imaginative proposals. However like many other grand plans in the wake of Lord Roger’s Urban Renaissance it takes ambition beyond credibility in the scale of development proposed, especially for the hugely challenging Waterfront area, and it skates over the difficulties of actually delivering high quality new places. The concept of turning the inner relief road into an urban boulevard (the ‘Great Street’) is also quixotic and frankly silly - much better to concentrate on improving the pedestrian routes across it. The ‘Great Street’ of Doncaster is actually the Great North Road and this is the axis that needs to be emphasised. With the failure of so many much-hyped regeneration schemes to deliver the promise of their rhetoric, coruscatingly analysed by Owen Hatherley in his new book ‘A Guide to the New Ruins of Great Britain’, a more realistic approach is surely required. This needs to focus more on strengthening the existing town centre rather than extending it, building on the many positive aspects of the place rather than aping the anonymity of so much urban regeneration. The top priority must be to reinforce and support the markets - they are a unique asset to the town and essential for a more sustainable future. A new Station Square and redevelopment of Sainsbury’s to re-establish Station Street are also essential to the self respect of Doncaster. This after all is still a railway town and its excellent rail connections are surely a major economic development asset to build on. New generation supermarkets is where all the planning and development action is at the moment. Donny needs to seize the opportunity to sweep away the old Sainsbury’s and Tesco stores which have blighted the town centre and give both the Station and St George’s a proper setting. Then it will deserve the accolade ‘City of Doncaster’. Excellent beers and good food were served at the Corner Pin on St Sepulchre Gate West. An interesting, comprehensive and fair review of my home town. By the way, the Central Library used to be a carpet warehouse. Lee, I thought I was joking with the jibe about the library looking like a funeral directors but a carpet warehouse makes perfect sense. I have not been able to see the plans for the new theatre which could transform this area but Donny will have to curb the highway engineer first! 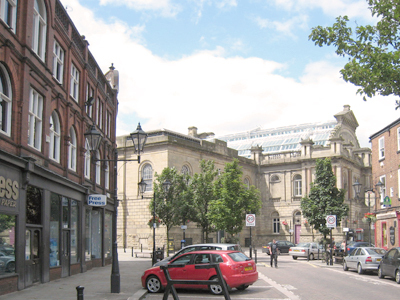 I grew up in Doncaster and trained as an architect and planner. I wholeheartedly agree with your analysis! 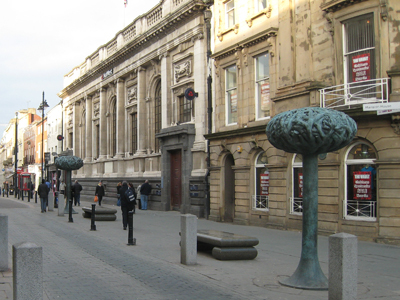 In the 1960s Doncaster swept away a late 19th century street pattern that was truly grand - I would say on a par with Newcastle's Grainger Town - and put the original incarnation of the Frenchgate centre in its place. That was just phase one of a half-century programme of systematic devastation. 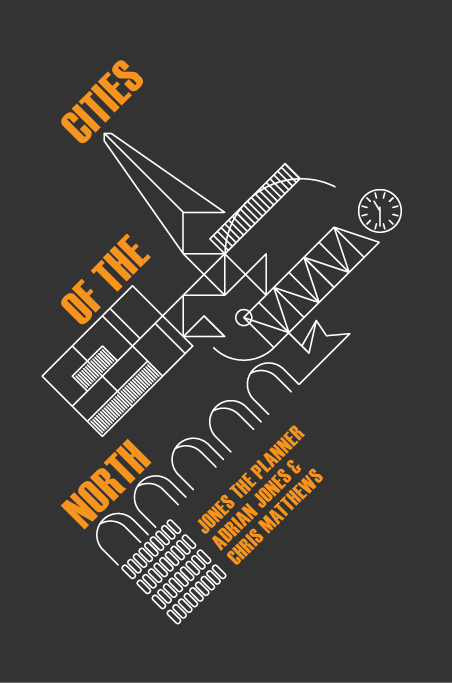 A town that cuts off its main church and its railway station from the rest of the centre, builds roundabouts as big as town centres in themselves, and then tries to regenerate by extending and compounding the original problems, whilst generally ignoring the unique and distinctive markets, really doesn't deserve to succeed, and its aspirations to be called a city are beyond the pale. Doncaster is a victim of chronic bad decision-making, and the Interchange is an amazing monument to just how badly things can be done. Only just caught this blog. I too don't understand why we needed the Frenchgate, when the big shops could've gone into new areas of the Town Centre. 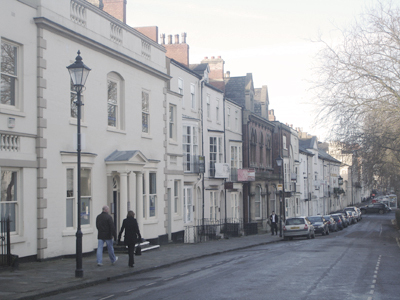 Silver Street and Cleveland Street is a mess, Hallgate is in decline and the area near Sunnybar is largely foreign shops which whilst adding variety, is hardly visited for shopping purposes by the rest of the town other than a thoroughfare. 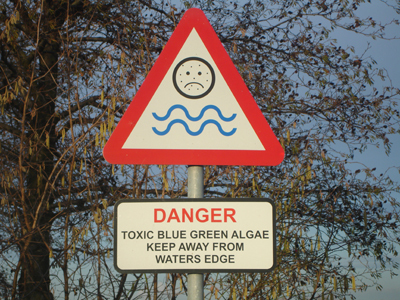 Thankful you didn't go down Waterdale though. The new Council chambers, performance venue and library being built there is needed but I do wish they had picked a better architecht, probably the same idiot that designed that absolutely awful health centre just outside the town on Trafford Way. Just to add to my comment in October though, I'd still like to point out that I'm thankful atleast that some historic buildings, such as the Mansion House, Market Hall and Corn Exchange and the many Georgian buildings have remained. 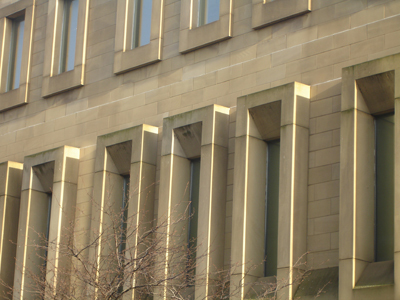 Always though that the library had some nice modernist lines that, with a sympathetic makeover, could complement the new CCQ buildings. I have only just come across this blog but scanning the review of Doncaster it's difficult not to agree with it. I'll probably post more later but I agree with the author about the view of the town from the railway station. The first thing that needs to happen is to shift Sainsbury off to a new site and then put a big bomb underneath that dreadful supermarket. Awful and expensive public transport is holding the town back (this month First increased some bus fares by 50p so that doesn't help the town centre). The fact that a huge number of people rely on cars (and the fact that the highway engineer rules this town) means that the out of town retail parks are doing relatively well while the town centre struggles to get people in. McDonalds has even taken up residence in the north of the town in the retail park near Bentley which also has an Xercise4Less, Home Bargains, huge Iceland and Morrisons. The car park there these days always seems to be absolutely rammed. Add into that the allure of free parking at Meadowhall and a shiny new Ikea near it to people willing to travel out and Donny doesn't look very attractive to the car obsessed population of Doncaster. Theres just no incentive to visit. Myself i just go Sheffield or Leeds. The new theatre from what i see fails to attract people. Well, it attracts a certain group of people (mainly older white middle class). The location just holds the place back. The shopping area near the theatre is just a declining mess with only Greggs and Iceland being the only noteable retailers. Many people (Doncaster has a very high ageing population by the way) complain that it's too far away from the bus station (again the huge problem of the Frenchgate being that it forces people to walk through it and at night now they close it off forcing people to walk all the way around it). The view of the town from the railway station still looks dreaful. It doesn't seem like Sainsbury is going anywhere or wants to go anywhere. It seems like they are willing to fight on until the very end haha! Then again if Sainsburys goes then that would be a nail in the coffin. People would just go out of town.